Some notes: Inflammation means literally in flame or on fire, and an acutely inflamed joint can be felt as hot by touch. Most metabolic heat comes from muscle and pathological conditions such as muscle spasm can be detected. Muscle areas near inflamed joints will be difficult to move due to pain and will appear hypothermic. Malignant melanomas can be detected by their increased temperature and this can be more effective in rewarming after cooling tests. Overview of the medical imaging modalities used within the electromagnetic spectrum. Medical Thermal Imaging“recognized by the American Medical Association council as a feasible diagnostic tool since 1987”. 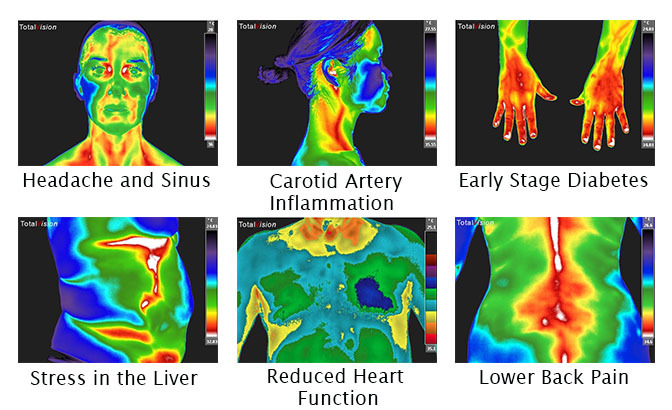 "In 2012, researchers pulled together all the research that has been done on heat scans. This is called a systematic review. They found that there is not enough evidence to show that thermography is reliable enough as a screening test for breast cancer. There is not enough evidence that it can help to diagnose breast cancer when used with mammograms in screening. And there is not enough evidence that it can help to diagnose breast cancer when there are signs that a breast cancer might be there. Until we have research evidence to show it is reliable, thermography is not recommended as a screening test or to try and diagnose breast cancer." Mammography misses tissue in proximity: “Abnormal activity related to breast disease that is outside the borders delineated by the equipment plates will be missed”. Facebook post by Tina Rucker Clemmons January 23, 2015 providing study in favor of breast thermography.